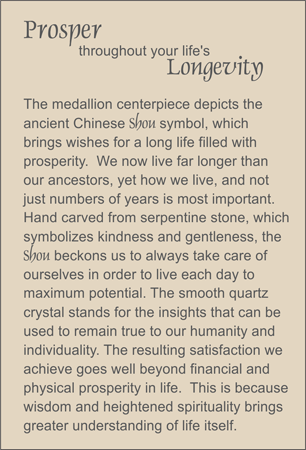 MEDALLION: Celadon color new jade hand carved medallion representing the ancient Chinese Shou symbol for long life and prosperity. ACCENTS: Rock quartz crystal beads carved with the ancient Chinese Shou for long life, and small quartz crystal ellipses. COMMENTS: A special way to say Happy Birthday. Scroll down to see Longevity in Cinnabar.